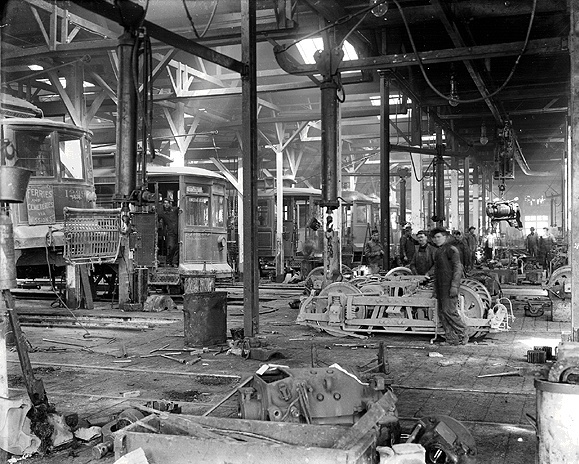 Carbarn interior, c. 1917. Strikebreakers were housed in these facilities during the protracted strike of 1917. 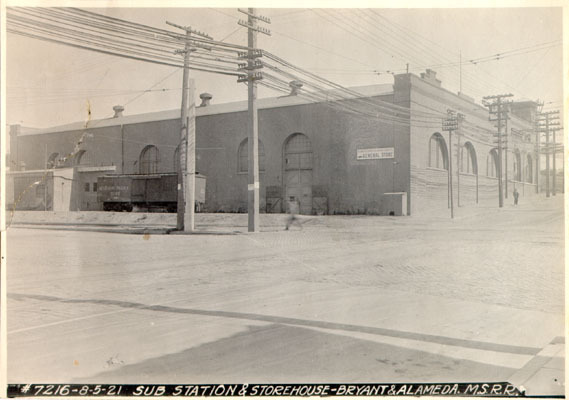 Railway barn at Bryant and Alameda next to the breweries, August 5, 1921. Photo: San Francisco History Center, San Francisco Public Library. This account, based primarily on SF Examiner articles of the period, describes the strike of 1917 against United Railroads, a former streetcar service in San Francisco, by its streetcar employees. The article details the week following the initial strike by streetcar workers demanding unionization, a minimum wage, and an 8 hour day. As thousands of workers joined the strike, United Railroads brought in scab workers to work the streetcars and employees to hassle the striking workers. Daily marches and mob attacks occurred throughout the city for three months until late November when the strike was finally defeated by the company whose ultimate power lay in the use of its resources to wait out the strike and leverage an entirely new workforce. "The strike's leaders... arranged with the crews of three cars to block Market Street and connecting lines at a certain hour. The crews were to run slowly so that when they stopped their cars a big blockade would result. The time was set at 9:50 o'clock. Five minutes before this Car 1534 of the Valencia street line stopped at the Market street junction. A Gough, Cortland car and a Market Haight car stopped at the same time. The cars following closely on each of these lines piled up quickly. The blockade was effective. The crews stood by their cars for a few minutes. Some removed their badges and mingled with the big crowd that collected. They all announced that they were on strike, that they were not satisfied with wages or hours or conditions. "Company officials and police arrived a few minutes later. Thirty or forty of the strikers left for the Labor Temple. They had been told to congregate there. On the way they tried to get the crews of several Sixteenth street and Mission street cars to desert. They were successful with the crew of one Sixteenth street car. Demonstrations took place in the street at this point. Poles were torn from the trolleys. A brick was hurled through a car window... It was an hour before the blockade was cleared... due in great measure to the fact that the striking motormen threw their controller bars away [and] the new crews had to hunt for the bars in the streets." The strike quickly spread, as URR workers quickly joined the strike and within just a few days over 1,000 were on strike demanding union recognition, $3.50 a day, and an 8 hour workday. Daily parades of strikers surged through the streets, all the way to the ferries and back up Market and Mission streets, exhorting those still working to walk off and join the strike. Mass meetings were held at the Redstone Building (at 16th and Capp), where delegations were selected to visit major industrial sites around town, such as the Union Iron Works, to rally workers to abandon the URR streetcars, while others headed for outlying carbarns to enlist more workers to strike. 1917 strikers march against United Railroads' open shop. Meanwhile mobs repeatedly attacked scab streetcars throughout the city. 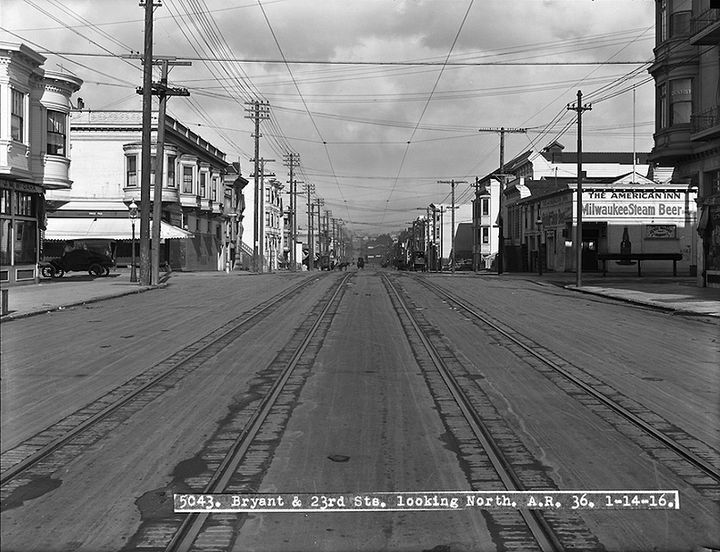 On August 13 police dispersed crowds at Bryant and 24th streets in the Mission and at 8th and Market. By the 14th, the strike had spread so thoroughly that the URR was forced to shut most of its lines. On the 15th a scab-driven inbound Sutter line car rammed into an outbound Municipal streetcar at Market and Sansome. Strike sympathizers tried to pull the scabs off the streetcar and in the ensuing melee, two URR employees were identified as "gunmen" to the police. Upon being arrested they were discovered to be holding three revolvers and a couple of blackjacks between them. URR brought in hundreds of strikebreakers and housed them in carbarns: 50 men at 24th and Utah (near SF General Hospital), 180 at 28th and Valencia, 75 at the Geneva barn, and 150 at Turk and Fillmore. "Edgar Hicks, a striker, boarded a [scab] streetcar at 21st and Folsom, and after paying his fare, asked the men to join the strikers. He was immediately set upon by a pair of [URR thugs], who were armed with iron bars and police clubs, and was severely beaten about the head and face... The prisoners were later released on $100 bail furnished by the United Railroads." 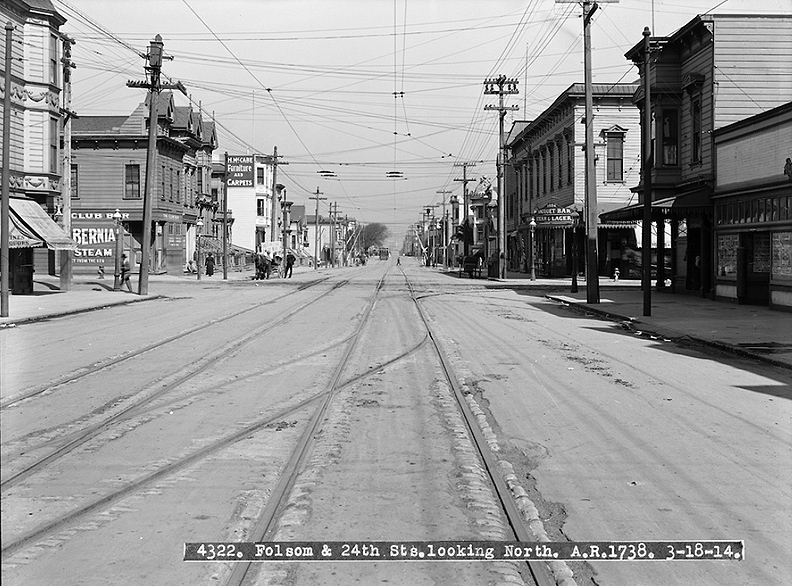 Folsom northerly at 24th, March 18, 1914, the days when streetcars crisscrossed the neighborhood. On August 17, another 100 men joined the strike, bringing the total to over 1,600 of the original 1,800 workers. Seven men in an automobile following the strikers' daily parade were arrested, and a search of their car discovered revolvers, clubs and other weapons. Five said they had just come from Los Angeles to work for URR, and that they were following the parade to incite a street riot. Two other carloads of men got away during the arrest. The arrested were released on bail posted by URR. On August 18 it was announced that an investigation had begun to determine which gun dealer had illegally sold 200 pistols to the United Railroads. On Sunday August 19, 2,000 strikers and their families paraded down Market street at noon, culminating in a mass meeting at Exposition Hall in the Civic Center. Banners in the parade state imploringly, "Family of 8. Could you support them on $3 a day?" During the meeting, one speaker embraced the strike's mainstream quality: "We are neither I.W.W. 's nor slackers. If there is lack of patriotism or respect for the law in this strike, it is not on the side of the strikers." On August 28, mob attacks were reported at Utah and 24th, 16th and Mission, 23rd and Folsom, 20th and Howard, and a brick attack on an inbound San Bruno car between Cortland and Oakdale. More mob attacks and bullets fired at streetcars in the Mission, the Sunset (at 10th and Lincoln) and elsewhere occurred daily. But after all that, the URR held out for months more, employing over 1,000 strikebreakers, many of them blacks hired in Chicago and brought in by train, and the strike was finally defeated by late November.